Talk about weird timing… With the news earlier today about the future of the DC Comics collector lines, let’s not forget that Mattel still has a year or so worth of figures to drop! Today I am running a set that’s recently dropped – the DC Multiverse Lobo Wave. This wave features Batman Beyond, Kingdom Come Superman, Kid Flash and Kyle Rayner Green Lantern, with the Collect N Connect being Lobo. The four primaries give you an alternate universe Justice League of sorts, with an alien bounty hunter as the big baddie, not a bad line up. All four are solid and feature above average articulation. The stand outs are Batman Beyond and KC Superman, they are executed well here. Lobo is also great. Articulation is a bit limited due to him being bulky, but sculpt, paint, and the metal chain weapon is top notch. In addition to the latest mass market wave, we are also including shots of the exclusive Bizarro figure. This is a Walgreen’s exclusive in the States. He’s well done with a removable cape and alternate jacket and glasses included. He also comes packaged backwards, with the cape facing out, which is awesome. All of these are available now at mass retail and online, hit your preferred spot to pick them up! 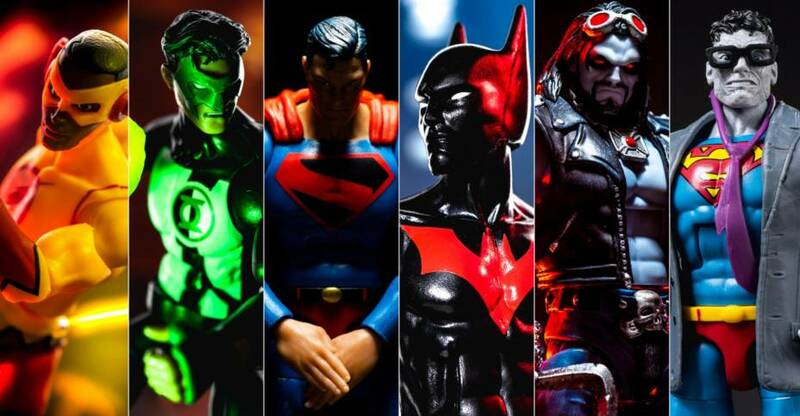 Read on to check out over 100 HD images of the latest 6 figures from DC Multiverse, courtesy of Mattel! DC Multiverse by Mattel is still going strong, offering 6 inch figures to the masses and pulling from all eras and sources of DC Comics. The latest wave, which we saw at SDCC is the Lex Luthor in the Super Suit Collect and Connect wave. This will feature 5 figures and be available all all major retailers. 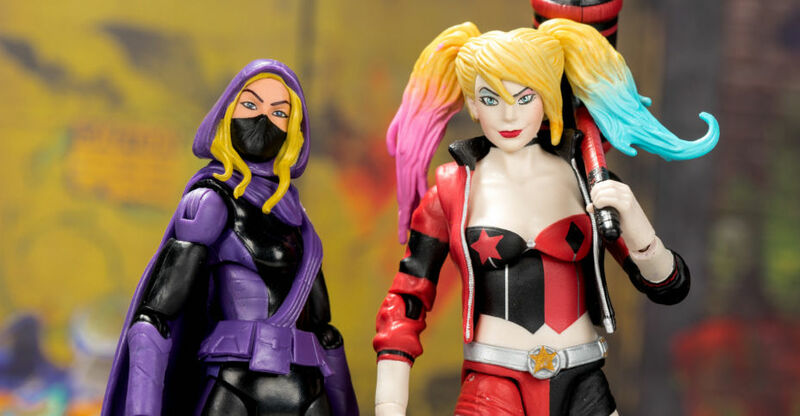 Mattel added in some bonus pieces to that CnC figure though through two Wal-Mart exclusives – Harley Quinn and Spoiler. If you grab them in addition to the main 5, you’ll get an alternate Apokalips head for Lex and a Motherbox. These 2 Wal-Mart figs dropped before the rest of the wave, and we are taking a look today at them both. Each are based on modern comic looks and come with multiple accessories. They are both out now, and as we mentioned earlier, they are Wal-Mart exclusives. Read on to check out what they can do after the break courtesy of Mattel! Hot off the presses, just got done shooting and we are dropping a gallery for the entire first wave of Mattel’s DC Multiverse Aquaman Movie wave 1! The wave consists of 4 figures, with all four giving you the Collect and Connect figure (yes 4, not 6 or 8). They kicked things off with the heavy hitters, Aquaman, Mera, Black Manta and Orm (aka Ocean Master). These are the collector level figs, so we get full range of articulation with cuts, twists and rockers where needed. For the price range of around 20 bucks per fig it’s well above average. Paint is also above par on all 4, with specific detailing, metallic sheen and weathering. The stars of the wave are Aquaman and Black Manta though, they really do shine. Sculpt on both are fantastic, they can hold their own with DC Collectibles and dare I even say the Japanese imports, especially when you factor in price. I was pleasantly surprised at the quality of this wave, and had a fun round of shooting with them. Now I gotta go get a mop and clean up. Read on to check out over 95 HD images of them all courtesy of Mattel! San Diego Comic Con is close! 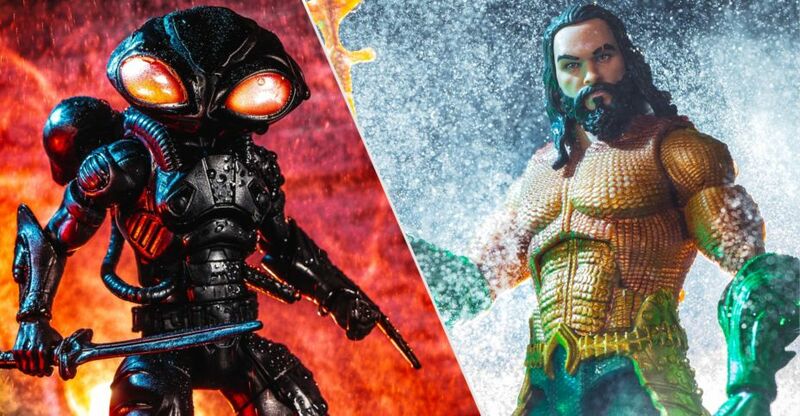 Today we are taking an early look at Mattel’s DC Multiverse SDCC offering – an Aquaman themed box set with Black Manta and Ocean Master based on the Between Two Dooms storyline! This is the first appearance of Black Manta in the comics where Ocean Master refused to let anyone else defeat Aquaman and chaos ensued! All three are DC Comics Multiverse 6 Inch figures with premium paint decos. A sheened paint is present on all three, and Aquaman features a new (and really sharp) head sculpt. 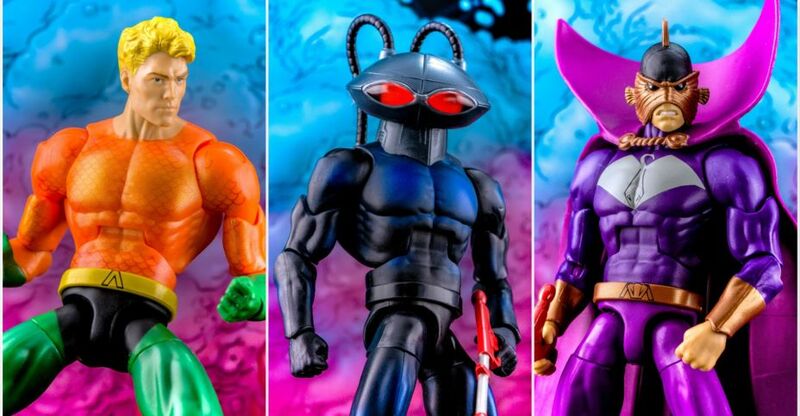 Black Manta and Ocean Master both come with harpoon style weapons. Black Manta also has 3 different sets of eyes – clear, red and yellow. All 3 have 2 extra sets of hands as well. To cap all that off, the box is large and super well done. An outer cardboard case reveals the inner packaging with colorful backdrop, and all 3 are positioned in a three way fight! The good thing about all this – even though it’s a themed package with posing, you can remove the figures and replace them without destroying it all. The plastic insert is not attached to any cardboard part and the figures pop out and return easily once the bands are cut. Big kudos to Mattel for that one! All in all, it’s a great choice for an exclusive. Aquaman is hitting theaters later this year and will have a big presence this weekend. These are classic themed and a step above retail with the paint options. Getting everyone hype for Aquaman and a little something extra for the Multiverse fans is a great mix. I’ve been light on Multiverse this year but these figures have grabbed my attention, when done right they are really awesome DC offerings! We’ve run them through the motions, read on to check out over 60 HD images courtesy of Mattel! DC Multiverse has been satisfying the main line retailer shelves with reasonably priced, accessible versions of the DC Universe. From video games to comics to movies, Multiverse has touched it. They’ve recently gone through a refresh with new packaging and there are some solid figures on the horizon based on what we saw at Toy Fair 2018. 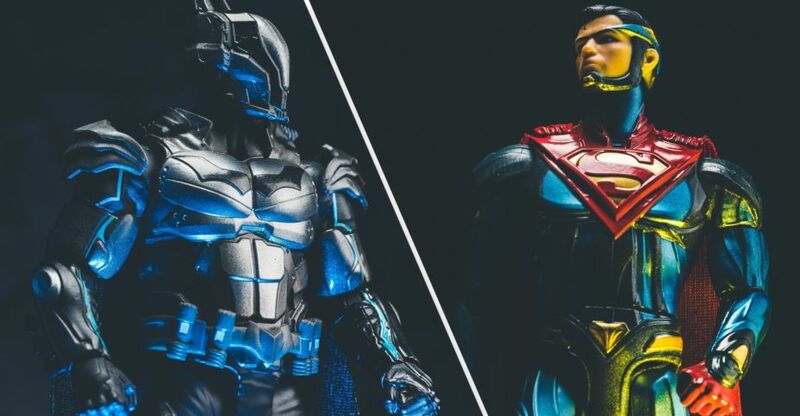 Today we are taking an early look at two upcoming figures in their new Platinum line – Injustice 2 Batman and Superman. What sets these apart from standard Multiverse figures is that they are solid die-cast. Heavy! They also feature premium paint with a metallic sheen to it above and beyond normal release standards. Both are 6 inch scale and feature mid-grade articulation. Present is head rotation with slight up/down capability, shoulder on pegged 360 rotation, bicep swivel, 90 degree elbow, wrist swivel, waist swivel, t-crotch, 90 degree knee swivels. Both feature a soft goods cape that is thin and lays flat, not meant for dynamic posing. The die-cast feels great in hand, but visually from a distance or in online pics, there isn’t much different than if it were plastic. Batman works better here as he is fully armored in his in-game Billionaire Suit. The die-cast angle makes sense. Superman, while technically armored, still doesn’t scream for a heavy chunk like this. Both will work for standard hero stance poses on the shelf, and will work best as centerpieces. I personally dig the Batman a lot and would be open to more like this for heavily armored figures, ones with masks. Think Lex Luthor Warsuit, non-video game Armored Batman(s), anything that’s meched out. That way you can focus on the bulky sculpt and not have to worry about translating a human face into toy form. As it is here, the Batman sculpt works super well with anything 6 inch scale in base poses. These guys are due for a wide release later in the year, with first availability at Gamestop in the US. Mattel sent these guys through to look at, so read on to check out over 40 HD images showing what they can do! Mattel is on the front line of the expansive DC licensing line up, producing figures and products for all age ranges in traditional outlets. While there are many collector focused options for figures, vehicles tend to be harder to come by. Today we are going to take a look at a gem of a piece – their 1/10 scale RC Justice League Batmobile. Don’t let the size class it’s listed as fool you, this is pretty much a 1/12 scale, aka 6 inch figure scale – Batmobile. It’s a fully functioning RC vehicle, with a top speed of 5.5 MPH, full steering controls. It also has multiple sound effects including an idle and engine rev that matches it’s speed. Missiles, guns and rockets all have unique sounds when triggered, matching their rotating and moving barrels on the car itself. It even has a video camera in the cockpit, so when you are zooming around you can see what it sees on your phone via an app. Lights are present on the front and back, and it even has an off-road raised mode as seen in the movie. The piece is capped off with a high end matte finish, rubber wheels, lighted cockpit that fits the 6 inch Multiverse-esque figure that comes with it. Oh, and btw – it basically has a vaporizer built in, you can fill it up with smoke juice and trigger exhaust out the back of the car with the press of a button! Straight up, this is a masterpiece. On it’s own, without any functioning RC capabilities, it would be worthy of attention. Throw in lights, sounds, video, and complete control via an app on your phone, and it’s pure win. Plus, it pretty much scales perfectly with 1/12 scale figures, so if you have any Batmen in your line up, they will work with this (visually). That cockpit is narrow so getting different figures in there may be tough. Depends on the figure, it’s cape, etc. 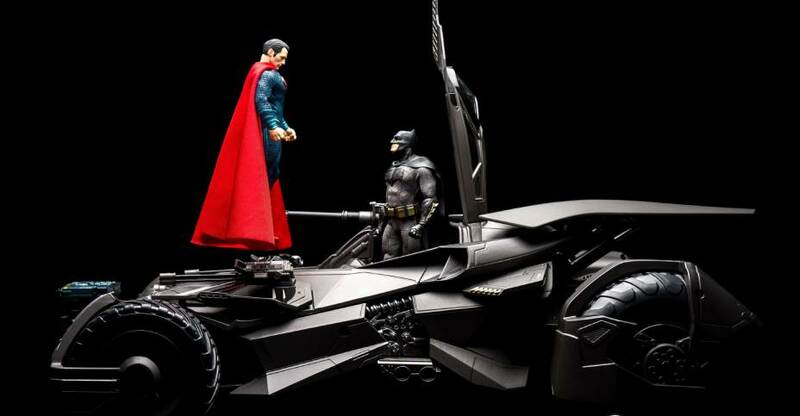 Read on to check out over 80 HD images of the Batmobile, showing it off from all angles, with other figures, and some pretty shots worthy of it’s centerpiece status. It is in stock now and shipping from site sponsor Entertainment Earth. It is a bit on the higher end price wise, but it is worth every penny. Even if only used as a display piece. The Toyark recently shot Wave 2 of Mattel’s 4 inch collector line, DC Comics Multiverse. We however didn’t realize when we picked them up that The Penguin was also out in the wild! Fans from the forums quickly let us know he is, so we went hunting and found him yesterday. We’ve done up a shoot, and are posting him up by himself because this guy really is the star of the wave. Check out our thoughts and 25 shots of Batman Returns Penguin after the break! 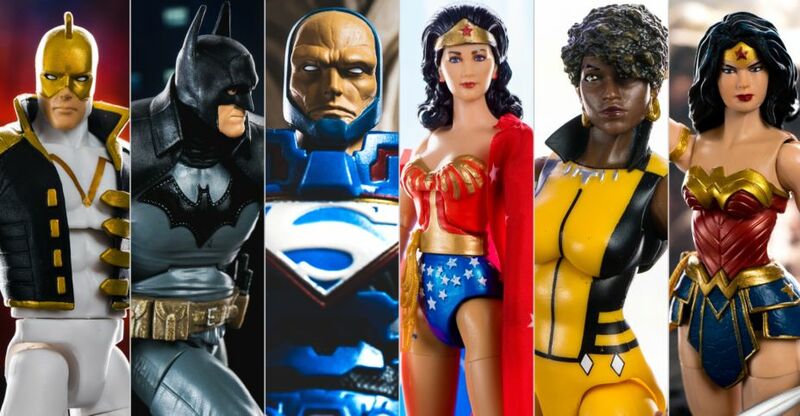 DC Comics Multiverse is Mattel’s current 4 inch Adult Collector line. The figures are based on different themes within DC Comics. Wave 1 featured characters from the Arkham video game universe, and wave 2 is focusing on classic movies. In this wave is 80s Superman II Zod, 89 Keaton Batman and 89 Keaton Batman Unmasked. Down the road, wave 2.5 or 3 (depending on how you look at it) will continue the movie theme with a Reeves Superman, Michelle Pfeiffer Catwoman, and DeVito Penguin. But let’s not get ahead of ourselves. Today we will run through Wave 2 of Multiverse, read on to check our thoughts and see 50 shots of these classic movie characters! DC Multiverse is Mattel’s new collector focused 4 inch line of action figures. The line will pull from all versions of the DC Universe over time, focusing on comics, movies, games and more. Wave 1 is trickling out now and has an Arkham Video Game theme showcasing both heroes and villains in their game styled suits. Included this round is Batman, Armored Batman, Azrael, Bane, Deadshot and Mr. Freeze. So, how does Mattel’s new adult focused line stack up to industry standards that have come before it? Read on to see our thoughts and over 90 shots of the wave 1 figures courtesy of site sponsor Entertainment Earth!